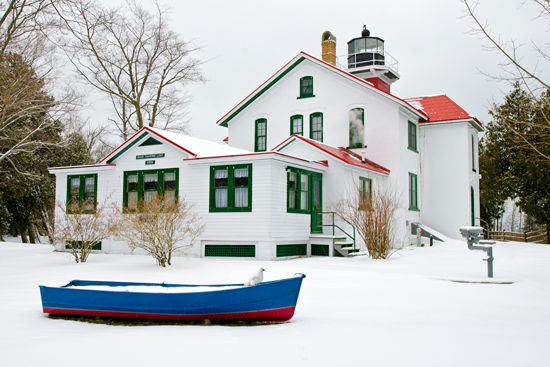 The Grand Traverse Lighthouse is situated at the end of the Leelanau Peninsula within the Leelanau State Park, about eight miles north of the town of Northport. 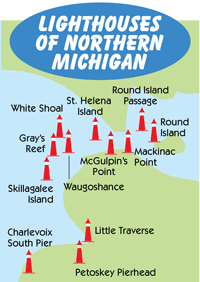 It's one of the oldest lighthouses on the Great Lakes, and has guided ships in the Manitou Passage of Lake Michigan for close to 150 years. 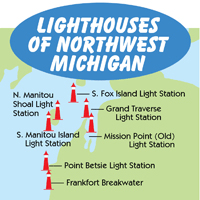 This lighthouse is sponsored by the Grand Traverse Lighthouse Foundation and you may tour the historic and educational museum, which depicts a lighthouse keeper's dwelling from the early 1900s. You will find a variety of exhibits depicting a broad spectrum of maritime and local history. Inside the lighthouse you can view various exhibits, including shipwrecks, foghorns, and other area lighthouses. 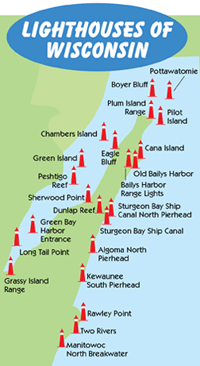 Demonstrations on the foghorn take place throughout the year, and a small admission fee lets you climb the tower where you are treated to fantastic views of Lake Michigan. In 1858, the present light was built, replacing a separate round tower which was built in 1852. Many refer to this as Northport Light, as it is near the town of Northport, or "Cat's Head Point Light." 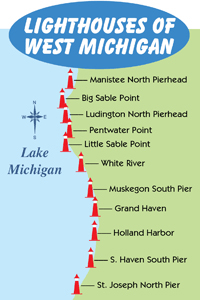 In 1852, the first light was built...a brick tower and separate keeper's quarters in the state park campground. Just six years later in 1858, these structures were razed and the present light was constructed. The Fourth Order Fresnel Lens is on display in the keeper's quarters, and the light itself is listed in the National Register of Historic Places.